Dubai is one of the seven emirates and the most populous city in the United Arab Emirates. The demography of Dubai comprises a varied mixture of different nationalities and ethnic groups. More than two-thirds of deliveries in Dubai occur in the twin government hospital, which comprises most of the Emirati (local) population. The incidence of preterm births is rising in Dubai due to increase in the population and fertility treatment trend in Dubai. About 15.2% of babies are born before 36 weeks of gestational age (GA), and 3.37% of the infants are born before 32 weeks of GA. Survival rate of infants born at 24–25 weeks of GA is about 60% in Dubai Government Hospital. The survival of extreme premature babies has remarkably increased due to advanced neonatal care. Retinopathy of prematurity (ROP) is a proliferating disorder of the immature retina, it is a pathologic process that occurs in immature retinal tissue and can progress to tractional retinal detachment in later stages, which can result in functional or complete blindness. The goal of the treatment with cryo  and laser ablation  is to destroy the avascular retina eliminating its demand for oxygen. Laser ablation of the avascular retina is a standard treatment for acute phase ROP. Use of peripheral laser therapy for nearly two decades has resulted in a markedly decrease in the incidence of poor visual outcome. Although laser treatment effectively halts the progression of Stage 3 ROP to Stage 4 ROP in 90% of patients, this treatment actually destroys large portions of the retina. However, despite of timely administered ablation of avascular retina, unfavourable structural outcome and increased recurrence rate are still unavoidable in some patients, especially for Zone 1 ROP, retinal detachment occurred in 12% of eyes in the ETROP study with adequate peripheral ablation. Moreover, conventional laser ablation of avascular retina is not possible in all acute ROP scenarios such as a very sick neonate with poor systemic condition, opaque media and poorly dilating pupils. For these reasons, ophthalmologist worldwide is investigating for an effective, less traumatic and convenient treatment options. Neovascularisation is mainly driven by vascular endothelial growth factor (VEGF). 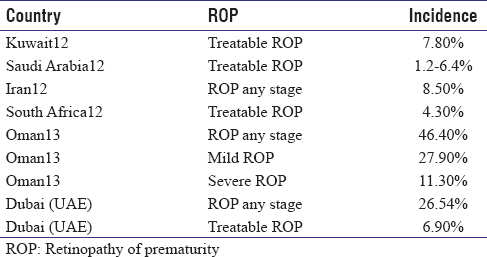 This study indicates the magnitude of ROP among the premature infants in Dubai. In this prospective, non-randomised study, we have estimated the incidence of treatable ROP in the two Government Hospitals of Dubai. Although it is a small study, it has a representation of multi-ethnic population in Dubai. We have evaluated the outcome of bevacizumab monotherapy in both Stage 2 plus and 3 plus diseases, considering the complication and practical hurdles of laser ablation in ROP. The infants of two major government hospitals in Dubai, Latifa Hospital and Dubai Hospital, Neonatal Intensive Care Unit (NICU) were screened for ROP. The retinal screening was performed by the trained retina specialist or trained ophthalmologist from the retina team of Dubai Hospital. The screening was based on the American. American Academy of Pediatrics (AAP) and the American Academy of Ophthalmology Joint recommendations for screening of infants for ROP. The screening included those infants with a birth weight of <1500 g or a GA of 31 weeks or less and selected infants with a birth weight of 1500–2000 g or a GA of >31 weeks with an unstable clinical course, including those who required cardiorespiratory support and those who were believed by their attending paediatrician or neonatologist to be at high risk. The time of initiation of ROP screening was based on AAP guidelines. Follow-up examinations were based on initial examination findings. Detail anterior segment and retinal findings were documented according to the International Classification for ROP. In this protocol, the frequent follow-ups were weekly. Any Stage ROP in Zone 1 and Zone 2 was followed up weekly. Detailed history, birth weight, GA, parity, comorbidities and its management were noted. We enroled infants from April 2010 to April 2014. The follow-up period was from 6 months to 1 year after the treatment. The inclusion criteria for treatable ROP was the infants with Type 1 ROP, Stage 2 plus, and Stage 3 plus ROP in Zone 1 and Zone 2 diseases. We classified Stage 3 ROP to early or vascular ROP and late or fibrovascular ROP. The infants having vascular Stage 3 plus ROP in Zone 1 and Zone 2 and Stage 2 plus in Zone 1 and Zone 2 was treated with intravitreal bevacizumab monotherapy. Exceptions for bevacizumab treatment were when parents did not give consent and another infant who had exudative retinal detachment, therefore, underwent peripheral laser ablation. We did not include the late or the fibrovascular Stage 3 plus disease whose prominent features are increase in fibrovascular tissue condensation and fibrous band formation with raised thickened ridge was excluded from the study since bevacizumab therapy in these cases can enhance fibrosis and cause contraction of the membranes leading to tractional retinal detachment. Hence, these cases underwent peripheral laser ablation. This study was approved by the Institutional Review Board of Dubai Hospital and registered with ClinicalTrials.gov identifier: NCT-01707745. Informed written consent was taken from the parents or guardian. All the intravitreal injection was given in the operation theatre of Dubai hospital under aseptic precaution, except for five very sick infants, the injections were given in the NICU itself. In the operation theatre, the procedure was done under the supervision of the anaesthetist and neonatologist. Povidone-iodine (betadine) eye drops 5% was instilled in both eyes and painted with betadine for 30 s. Intravitreal injection was given under topical anaesthesia (Tetracaine 0.5%). Bevacizumab 0.75 mg/0.03 ml was injected with 30G, ½inch needle. The site of the injection was between 1 and 1.5 mm away from the limbus in the inferotemporal quadrant avoiding lens touch. Sterile cotton bud was used to stabilise the globe and to rotate the globe nasally. Transient clouding of the cornea was observed following each successful injection. Each eye was separately draped, and the procedure was repeated. All the injection was bilateral. The whole procedure took <5 min. Topical tobramycin eye drops were instilled four times a day for a week after treatment. Indirect Carl Zeiss Visulas 532s, green laser was used for peripheral laser ablation. The laser ablation was done in the operation theatre of Dubai hospital under general anaesthesia. Following treatment, the infants were examined after 1 week. In this study, we have determined the current incidence of treatable ROP in Dubai's two government hospitals. We evaluated the outcome following bevacizumab monotherapy. The sequelae following bevacizumab treatment such as the regression pattern, recurrence, progression of ROP, and adverse effects were monitored for at least 6 months after treatment. When no abnormal vascularisation was noted with the absence of retinal fold, blood vessels reached the far periphery of the retina with the absence of plus sign, the eyes were considered as regressed ROP. Thereafter, the screening examinations were continued until the eyes were considered stable after ROP regressed. The recurrence was defined as where ROP initially regressed after treatment and the normal vascularisation resumed; however, at some point, there is a cessation of vascularisation and the disease reappeared and reached the treatable ROP stage. Progression was defined as despite treatment the disease continued to advance with no signs of regression. The ocular as well as the systemic side effects following the treatment with bevacizumab were monitored by both the ophthalmologist and neonatologists. The statistical analysis was performed by MedCalc Software bvba, Version 16.2.1 (Acacialaan 228400, Ostend, Belgium). P value was calculated according to Sheskin DJ, 2004. P<0.05 was considered statistically significant. A total of 810 premature infants were screened from April 2010 to April 2014. The infants comprised 40 nationalities. Almost 52.4% of the population was Emiratis. Average GA was 28 weeks, range: 23–36 weeks. Average birth weight was 940 g, range: 500–2010 g. Among them, 215 had ROP (26.54%). There were six infants >32 weeks of GA and >1500 g. Only one infant with 33 weeks GA and birth weight 1700 g developed Stage 1 ROP in Zone 2, which spontaneously regressed. About 112 eyes of 56 neonates (6.9%) developed treatable ROP. These infants belonged to 16 different nationalities. [Figure 1] shows different nationality infants with treatable ROP. All neonates were followed up for a minimum period of 6 months to 1 year following treatment. [Table 1] shows the incidence of ROP in some the Middle East and African countries in comparison with Dubai (this present study)., Out of 56 infants, 55 (98.2%) were very low birth weight (VLBW) that is <1250 g. Only one infant was >1251–1500 g birth weight. Average birth weight was 751.4 g (range: 545–1320 g). Average GA was 25.80 weeks (range: 24–30 weeks). Of 25.8% infants born premature (below 36 weeks GA), 26.54% infants developed ROP and 6.90% infants developed treatable ROP. 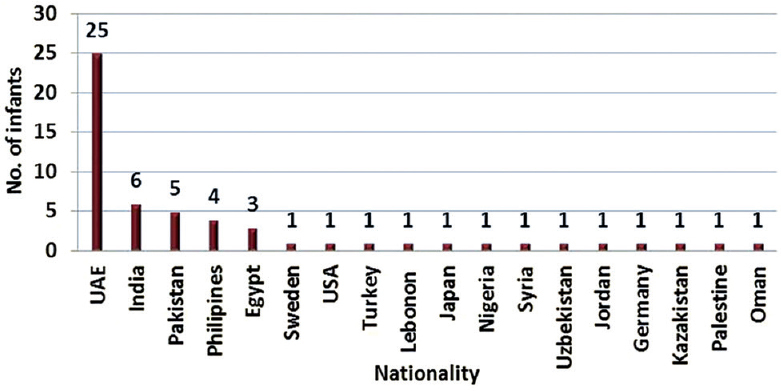 [Table 1] shows the incidence of ROP in the Middle East countries compared the incidence of ROP in this study in Dubai. About 12 eyes of six infants underwent laser. About 100 eyes of 50 neonates received intravitreal bevacizumab. One infant who underwent bevacizumab therapy died within 6 months (4 weeks after treatment). Another infant who underwent laser ablation died within 6 months (2 weeks after treatment). These two infants were excluded from the study. Two infants lost for follow-up (5 weeks and 6 weeks, respectively) after bevacizumab treatment were also excluded from the study. One infant who had undergone bevacizumab treatment died after 29 weeks (6 months after treatment), this infant was included in the study. Therefore, 10 eyes of five infants treated with laser treated and 94 eyes of 47 infants treated with intravitreal bevacizumab were included in the study. The average GA 25.83 (23–29) weeks and birth weight 757.83 g (545 to1320 g) of infants who received bevacizumab therapy. Average post-menstrual age (PMA) at the time of treatment was 36.74 weeks (32–47) range. ROP regressed in 87 eyes (92.6%). In 7 eyes of 4 infants (7.4%), there was a recurrence of ROP. There were 37 eyes of 20 infants with Stage 3 plus ROP who received bevacizumab treatment. Two eyes of two infants had a recurrence of ROP. About 57 eyes of 30 infants with Stage 2 plus ROP received bevacizumab. Five eyes of three infants had a recurrence of treatable ROP. There were eight infants who developed treatable ROP (Stage 2 plus and 3 plus groups) as early as 32–34 weeks of PMA. The details of infants and outcome following bevacizumab therapy in vascular Stage 3 plus and Stage 2 plus diseases are illustrated in [Table 2] and [Table 3], respectively. Of the 10 eyes of five infants who underwent laser. Three infants (60%) had fibrovascular Stage 3 plus ROP in both the eye, one infant (20%) had vascular Stage 3 plus ROP in both the eye and one infant (20%) had Stage 2 plus ROP in both eyes. In three infants (60%), ROP regressed; and in two infants (40%), the ROP progressed to Stage 4 requiring surgery. One infant-parent did not give consent for bevacizumab therapy; he had vascular Stage 3 plus ROP and another infant with Stage 2 ROP had bilateral exudative retinal detachment for reasons unknown, following ventricular tap for hydrocephalus, these two infants underwent peripheral laser ablation. Laser was preferred in this case to prevent the risk of injury to the retina while performing intravitreal injections. By peripheral retinal indentation, the subretinal fluid was displaced while performing laser ablation. The infant was later treated with Systemic Hydrocortisone by the neonatologist, the exudative retinal detachment. Resolved within 2 weeks and ROP also started to regress. The details of infants who underwent laser therapy are illustrated in [Table 4]. About 18 eyes of 10 infants developed Aggressive posterior ROP (APROP). APROP is defined as the severe form of ROP with Stage 3 plus in Zone 1 and Zone 2 posterior. About 16 eyes of 8 infants received intravitreal bevacizumab and in two eyes of an infant with fibrovascular Stage 3 plus ROP, received laser peripheral ablation. In 18 eyes, the ROP regressed including two eyes which received laser. Treatable ROP recurred in two eyes of an infant, this infant underwent peripheral laser ablation, and the ROP regressed. The average GA was 25.4 weeks (range: 24–26) weeks; average birth weight was 747.3 g, (range: 670–900 g). The average PMA at the time of treatment was 36.6 weeks, (range: 34–43 weeks). There was no significant difference in GA, Birth weight and PMA at the time of treatment, between all the infants with treatable ROP and infants who developed APROP. About 18 eyes of 10 infants developed Aggressive posterior ROP (APROP). APROP is defined as the severe form of ROP with Stage 3 plus in Zone 1 and Zone 2 posterior. 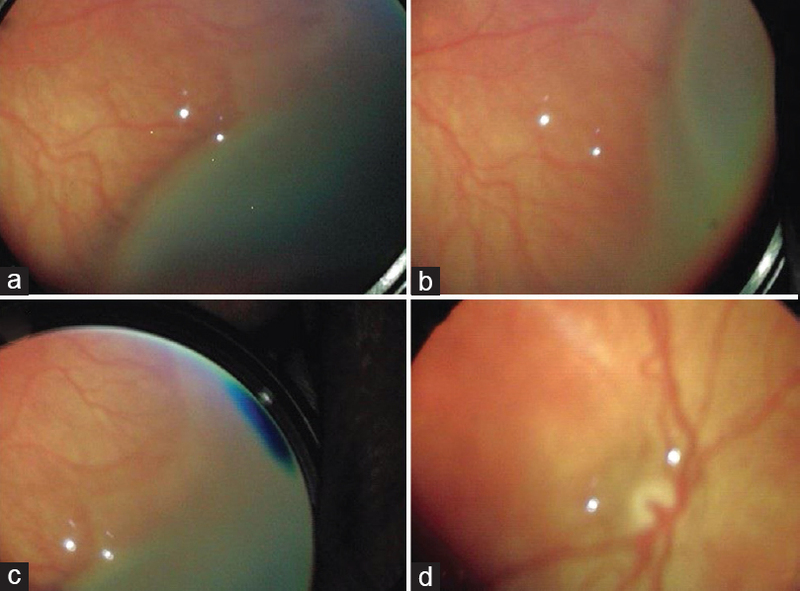 About 16 eyes of 8 infants received intravitreal bevacizumab and in two eyes of an infant with fibrovascular Stage 3 plus ROP, received laser peripheral ablation. In 18 eyes, the ROP regressed including two eyes which received laser. Treatable ROP recurred in two eyes of an infant, this infant underwent peripheral laser ablation, and the ROP regressed. The average GA was 25.4 weeks (range: 24–26) weeks; average birth weight was 747.3 g, (range: 670–900 g). The average PMA at the time of treatment was 36.6 weeks, (range: 34–43 weeks). There was no significant difference in GA, Birth weight and PMA at the time of treatment, between all the infants with treatable ROP and infants who developed APROP. 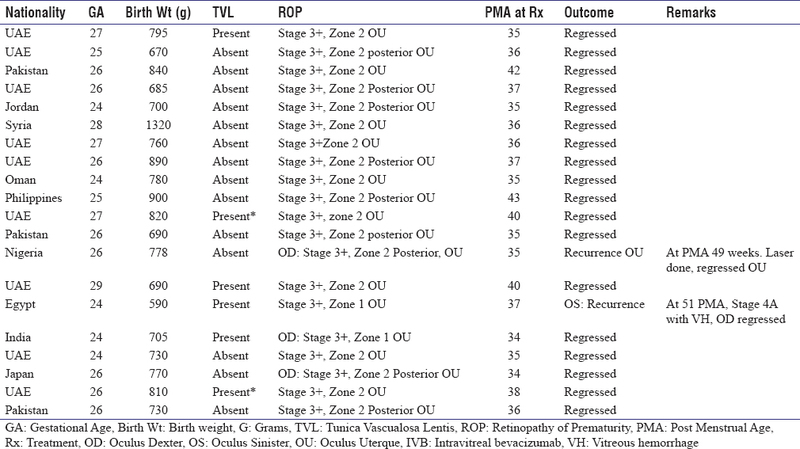 The details of the infants with aggressive posterior retinopathy of prematurity are given in [Table 5]. Seven eyes of four infants had a recurrence of treatable ROP, two eyes of an infant who had Stage 3 plus disease and five eyes of three infants who had Stage 2 plus disease. In three eyes, the ROP was posterior. The average PMA of recurrence ROP was 14.25 (range: 13–16) weeks after intravitreal bevacizumab therapy. Two of these infants had lost for follow-up for 3 months after intravitreal bevacizumab. Four eyes of two infants underwent laser peripheral ablation, and the ROP regressed. One infant had developed Stage 4A ROP was referred for surgery. Two eyes of an infant developed Stage 3 plus ROP with vitreous haemorrhage in Zone 2 anterior, 16 weeks following bevacizumab treatment, at 54 weeks PMA. This infant was closely observed; however, no treatment was initiated due to the poor systemic condition. Eventually, this infant died at 67 weeks of PMA. The details of infants with recurrence are illustrated in [Table 6]. Ten infants had poorly dilating pupils due to tunica vasculosa lentis with treatable ROP. This was considered as an important plus sign for treatable ROP since it not only precludes fundus examination but also makes peripheral laser ablation difficult. Intravitreal bevacizumab is the preferred option to treat these cases. Only one infant who was lost for follow-up for >3 months following bevacizumab therapy, developed Stage 4A ROP. Otherwise, no infants developed cicatrisation, retinal traction or retinal folds. In all cases except those who had a recurrence of ROP and underwent laser ablation, the retinal vascularisation was seen till the far periphery. No eyes developed ocular inflammation, cataract due to lens trauma, vitreous haemorrhage, retinal incarceration or retinal detachment following intravitreal bevacizumab. These infants were also closely monitored by the neonatologist. After discharge from the NICU, these infants were examined regularly in the outpatient clinic for at least 6 months to 1 year after the treatment. Weekly follow-up was scheduled until vessels reached the far periphery. Once the eyes were considered stable, they were referred to the paediatric ophthalmology department. We included Type 1 ROP infants with Stage 2 plus and vascular, Stage 3 plus ROP in Zone 1 and Zone 2. In 92.6% eyes, the ROP regressed. There was no statistical difference (P = 0.5473) between the outcome in Stage 2 plus or Stage 3 plus ROP. There was recurrence of ROP in 7.4% cases. Only one eye of the seven eyes with recurrence had developed Stage 4A ROP with vitreous haemorrhage involving the temporal quadrant. All other infants with a recurrence of ROP were successfully lasered, and the ROP regressed. None of the infants who had received bevacizumab treatment developed macular drag, intense cicatrisation due to fibrosis. Studies have shown the vitreous concentration of VEGF in vascular active ROP was significantly higher than in eyes with vascular inactive ROP., Therefore, the best timing for anti-VEGF treatment would be vascular Stage 3 plus ROP. [Figure 2] shows indirect ophthalmoscopy (IDO) image of an infant with Stage 3 plus ROP in Zone 2. [Figure 3] shows IDO image of the same infant showing regression of ROP and plus sign, 5 weeks following bevacizumab injection. There are some neonates who do not respond to any traditional treatment despite early detection and timely treatment; it is difficult to predict which cases would resolve spontaneously and which would progress hence, the ophthalmologist always must stay vigilant in detecting the treatable ROP and administer timely treatment. This warrants meticulous screening for aggressive ROP cases in <1 week, thus not missing the treatable window period. By close screening strategy, even treatment of Stage 2 plus diseases can be avoided since >50% of the Stage 2 ROP spontaneously regress. The average PMA at the time of treatment was 36.74 weeks (32–47) range. 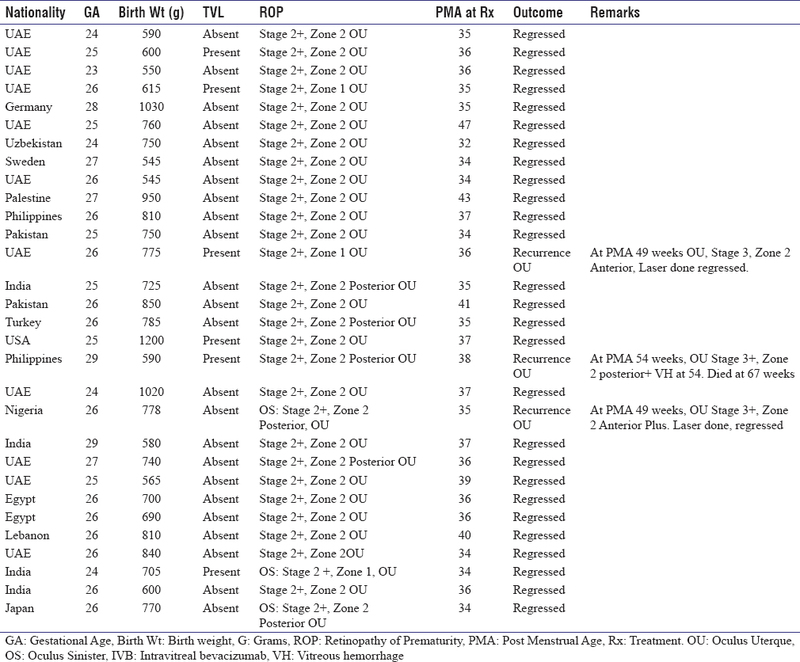 There were eight infants who developed treatable ROP between 32 and 34 weeks of PMA. The initial screening of infants in most of the centres is 31 weeks PMA in infants with GAs of 26 weeks or less at birth and at four weeks' chronological age in infants with GAs of 27 weeks or more at birth. If the infant's initial examination takes place at 31 weeks or later of PMA, there are chances that early stages of ROP will be missed. To avoid surprises during the initial examination and for proper documentation of ROP, the initial screening ideally should start earlier. We recommend all infants to be screened at 4 weeks of chronological age irrespective of the GA, although in some cases it may not be appropriate due to media haze. Even a hazy posterior pole view would give some idea about the ROP status and further screening strategy. We noticed two types of regression pattern following bevacizumab therapy. The first type was the eyes with rapid regression of ROP; there was a regression of new vessels and disappearance of tunica vasculosa lentis, followed by flattening of the ridge. Within a couple of weeks' vascularisation of retina was noticed, by 5–7 weeks after injection, the vascularisation until the far periphery was observed. The plus sign slowly waned. Most of the eyes had rapid regression of ROP following bevacizumab treatment. Regression after the single injection has been reported in over 90% of cases in many studies., The second type of regression was eyes with inadequate response to bevacizumab treatment. In only few eyes, this response was observed. In these eyes, there was a regression of new vessels and the tunica vasculosa lentis; in some cases, even the ridge completely disappeared slowly, but the vascularisation did not proceed and mild plus sign persisted. These were the eyes which needed close monitoring for recurrence of ROP. Six eyes of three infants, who were regularly monitored, developed recurrence. Recurrence occurred at 13, 14 and 16 weeks after bevacizumab treatment (average 14.25 weeks). [Table 6] illustrates the details of the infant who had a recurrence after intravitreal bevacizumab. [Figure 4] shows IDO image of the infant who had lost for follow-up for 13 weeks after intravitreal bevacizumab, shows recurrence of ROP. This infant developed fibrovascular Stage 3 plus ROP in Zone 2 anterior. In this study, 1.06% of eye developed Stage 4A retinal detachment following bevacizumab therapy. Therefore, anti-VEGFs are effective treatment for vascular ROP; backup laser ablation is mandatory in non-responding cases, cases with recurrence, parents who do not consent for anti-VEGFs treatment and certain clinical scenario which does not permit intravitreal injection such as the case of exudative retinal detachment, with treatable ROP. This warrants the availability of expert retina specialist who can deliver adequate peripheral laser ablation and setup for general anaesthesia. In this study, despite timely laser ablation, ROP progressed in two infants. One infant developed, Stage 4A in both the eye and another developed Stage 4B in both the eye VLBW neonates have the more severe form of ROP and they also have comorbidities, stress of intubation and long general anaesthesia and the effects of the drugs used during anaesthesia should also be considered while planning the treatment. Moreover, peripheral laser ablation in very sick infant, rigid pupils and hazy media are not the treatment of choice. Various studies have used different dose of bevacizumab to treat ROP. The patients in the BEAT-ROP protocol received half the adult dose of bevacizumab, 0.625 mg in 0.025 ml of solution. The most common dose used is 0.75 mg in 0.03 ml solution, with a range of 0.4 mg to 1.25 mg. However, it is uncertain whether repeated doses would still be safe. Probably the dose of bevacizumab should be titrated according to the weight of the infant at the time of injection so that the possibility of systemic and ocular toxicity of the drugs can be reduced VEGF is a double-edged sword. It is necessary for the physiological angiogenesis and also promotes pathologic angiogenesis. Various studies in both animals and humans,, have found evidence of systemic bevacizumab exposure after intravitreal bevacizumab therapy. Most of the time bevacizumab therapy takes place at 37–40 weeks of GA. By this time, the development of most of the organs is complete, but neurogenesis continues in the third trimester. It has been speculated that the anti-VEGF therapy would further lead to inhibition of serum VEGF in preterm newborns and thus having long-term effects on the development of the central nervous system and other systems. This is a small study, like other previous short-term studies, anti-VEGFs in the treatment for ROP results are encouraging. However, backup laser is mandatory. Recent reports indicating long-term detrimental effects on neuromotor development following anti-VEGF therapy in infants with ROP raise concern., Therefore, before adopting anti-VEGFs as an alternative to laser ablation, more prospective, controlled, long-term, multicentral studies are needed in Middle East countries as there is improved survival of the very premature infant. Stebin Xavier. Statistician: Al Zahra Private Hospital. Dubai, UAE. Multicenter trial of cryotherapy for retinopathy of prematurity. Preliminary results. Cryotherapy for Retinopathy of Prematurity Cooperative Group. Arch Ophthalmol 1988;106:471-9. Early Treatment for Retinopathy of Prematurity Cooperative Group. Revised indications for the treatment of retinopathy of prematurity: Results of the early treatment for retinopathy of prematurity randomid trial. Arch Ophthalmol 2003;121:1684-94. Hurwitz H, Fehrenbacher L, Novotny W, Cartwright T, Hainsworth J, Heim W, et al. Bevacizumab plus irinotecan, fluorouracil, and leucovorin for metastatic colorectal cancer. N Engl J Med 2004;350:2335-42. Mintz-Hittner HA, Kennedy KA, Chuang AZ; BEAT-ROP Cooperative Group. Efficacy of intravitreal bevacizumab for stage 3+ retinopathy of prematurity. N Engl J Med 2011;364:603-15. Wu WC, Yeh PT, Chen SN, Yang CM, Lai CC, Kuo HK, et al. Effects and complications of bevacizumab use in patients with retinopathy of prematurity: A multicenter study in Taiwan. Ophthalmology 2011;118:176-83. Quiroz-Mercado H, Martinez-Castellanos MA, Hernandez-Rojas ML, Salazar-Teran N, Chan RV. 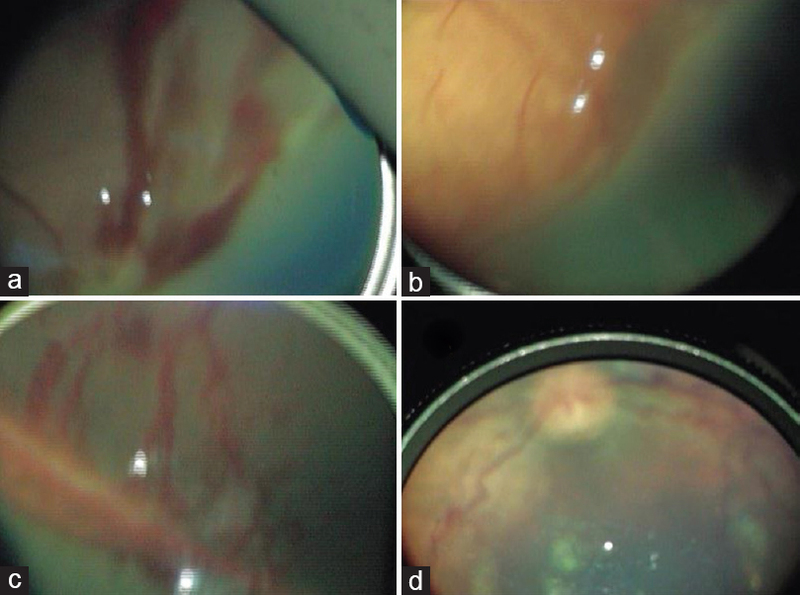 Antiangiogenic therapy with intravitreal bevacizumab for retinopathy of prematurity. Retina 2008;3:19-25. Morin J, Luu TM, Superstein R, Ospina LH, Lefebvre F, Simard MN, et al. Neurodevelopmental outcomes following bevacizumab injections for retinopathy of prematurity. Pediatrics 2016;137. pii: e20153218. Lien R, Yu MH, Hsu KH, Liao PJ, Chen YP, Lai CC, et al. Neurodevelopmental outcomes in infants with retinopathy of prematurity and bevacizumab treatment. PLoS One 2016;11:e0148019. Honda S, Hirabayashi H, Tsukahara Y, Negi A. Acute contraction of the proliferative membrane after an intravitreal injection of bevacizumab for advanced retinopathy of prematurity. Graefes Arch Clin Exp Ophthalmol 2008;246:1061-3. Al-Alawi ESK, Bhaleeya SD, Chapman K, Coombs WC, Klufas M, Patel S. Incidence of severe ROP in Africa/Middle East region-specific information (Africa/Middle East). American Academy of Ophthalmology; 2013. Jacob MK, Sawardekar KP, Ayoub HG, Busaidi IA. Validation of the existing modified screening criteria for detection of all cases of retinopathy of prematurity in preterm babies-11 year study from a governorate referral hospital in Oman. Saudi J Ophthalmol 2016;30:3-8. Slidsborg C, Olesen HB, Jensen PK, Jensen H, Nissen KR, Greisen G, et al. Treatment for retinopathy of prematurity in Denmark in a ten-year period (1996 2005): Is the incidence increasing? Pediatrics 2008;121:97-105. Sonmez K, Drenser KA, Capone A Jr., Trese MT. Vitreous levels of stromal cell-derived factor 1 and vascular endothelial growth factor in patients with retinopathy of prematurity. Ophthalmology 2008;115:1065-700. Sato T, Wada K, Arahori H, Kuno N, Imoto K, Iwahashi-Shima C, et al. Serum concentrations of bevacizumab (avastin) and vascular endothelial growth factor in infants with retinopathy of prematurity. Am J Ophthalmol 2012;153:327-330. Ju RH, Zhang JQ, Ke XY, Lu XH, Liang LF, Wang WJ, et al. Spontaneous regression of retinopathy of prematurity: Incidence and predictive factors. Int J Ophthalmol 2013;6:475-80.